It gives me great pleasure to announce that Dr. Ronald Williams Jr. will be the guest speaker at Lee’s Breakfast Club on Saturday morning, 20 April 2019. 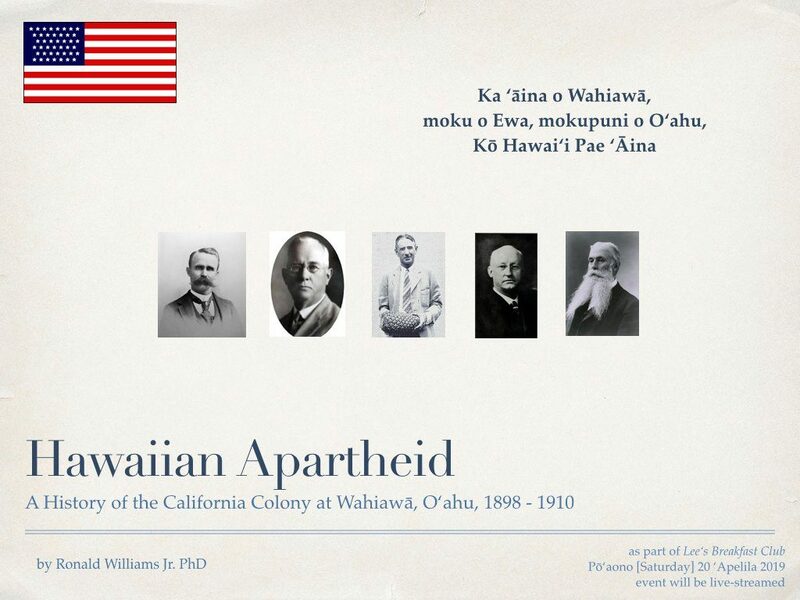 I encourage anyone on the island of O’ahu to join us for breakfast at 10:00am and hear Dr. Williams presentation—”Hawaiian Apartheid: A History of the California Colony at Wahiawā, Oʻahu, 1898-1910—beginning at 11:00am. Dr. Williams earned his PhD in History of Hawai’i with a focus on a historiography that platforms Native voice through Hawaiian-language sources. He is a former president of the 127-yr old Hawaiian Historical Society, owner-principle researcher and writer at Ka ʻElele Research and Writing and an archivist at the Hawai’i State Archives. He describes himself as a father, writer, PhD, historian, researcher, story-teller, Buddhist, surfer, moments of beauty-seeker. I’m going to add to that list an incredibly interesting and passionate speaker. Lee’s Breakfast Club, held every Saturday from 10-noon in the laid-back Face Cafe on the grounds of the Ryoin-on-the-Eames in the high lands of Wahiawā, Hawai’i, is a private initiative of its host, Lee Lewis, to promote one of the major tenants of the Bahá’í Faith, namely the unification of the human race. “Breaking bread together to breakdown the barriers that keep us from uniting” is the mission statement of Lee’s Breakfast Club. Activities at Lee’s Breakfast Club include sharing a breakfast of blueberry buttermilk pancakes with numerous choices of toppings including a maple syrup, garden fresh omelettes or egg scramblers, a rice medley and LEE Coffee. After breakfast here is a guest speaker or entertainer whose segment is shared on Facebook Live beginning at around 11:00 am Hawai’i time, please tune in! Each breakfast is “sponsored” by a food, a virtue and an Hawiian word of the day.